We're back with another edition of Ready For The Weekend and it's another packed weekend of events. Let's have a little peak at the wrestling goodness that awaits. 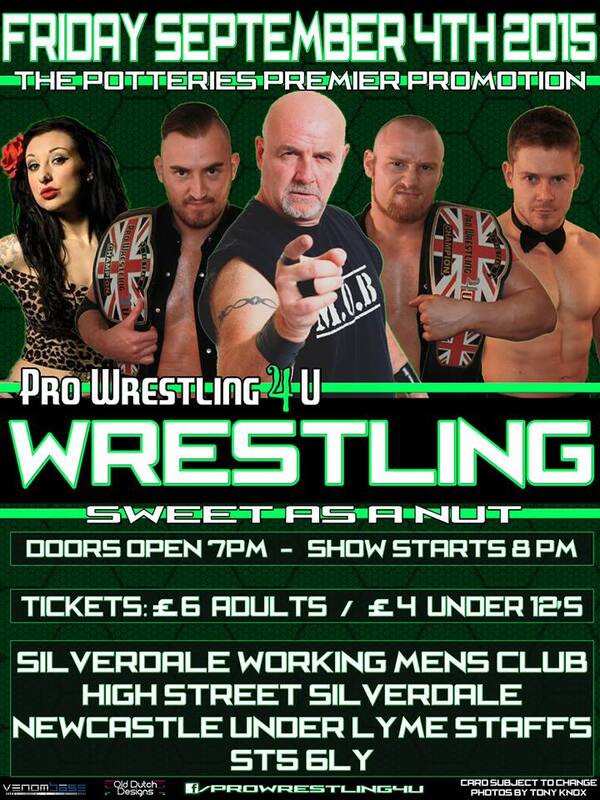 On Friday night, Pro Wrestling 4 U return to their familiar haunt of the Silverdale Working Mens Club in Newcastle-Under-Lyme with Sweet As A Nut. In a turn from their normal events, PW4U have allowed the fans the opportunity to vote on certain aspects on some of the matches. One of the options that was chosen was a Best Of 3 Series between Violet Vendetta and Laura Jane. While Laura Jane may be a newcomer to PW4U, Violet Vendetta's actions and personality have made sure that the fans of PW4U won't forget her. Could Laura Jane cause an upset and steal Vendetta's thunder? We'll find out on Friday. 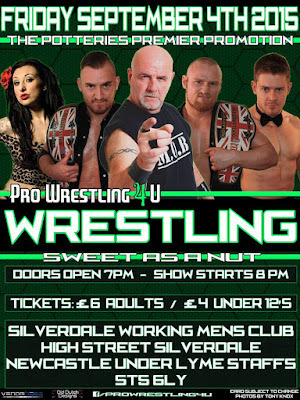 A majority of the matches announced have been subject to a vote on social media, however the PW4U G6 Championship defence will be a bit different as the vote will take place live at the Silverdale Working Mens Club. Jurgen Heimlich has been a fighting champion since winning the title and on September 4th he'll be in a fight again but he's in the dark over whether he'll be facing Robert Sharpe, Noah or Zak Northern. In the main event, Keith Myatt shall defend the PW4U Championship against Barricade. Now that is a challenge in itself even for a veteran of the squared circle such as Keith Myatt. Now add in the fans choice of a Tables Match and the challenge increases tenfold. That being said, Keith Myatt became the champion due to his skills and will to win. Barricade faces as much of a challenge to dethrone Myatt as Myatt does to keep the title. 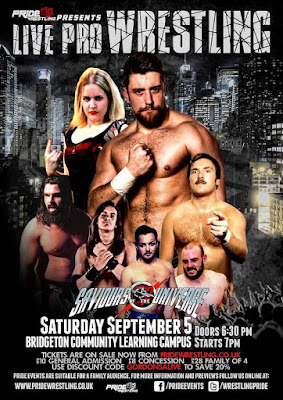 Moving on to Saturday night and Pride Wrestling are back in action with Saviours Of The Universe in Bridgeton, Glasgow. Pride Wrestling are known for blending established names with up-and-coming talent and this event is no different. Two men who are very well known to Pride Wrestling and British fans as a whole are Dickie Divers and Joe Coffey. These men have had their battles in Pride Wrestling before, in fact they competed on the first show in Bridgeton. However 5 years have gone by since that encounter and both men have grown and evolved in that time. Now it's time to see what has changed since 2010 when this rivalry is renewed. Some big names have been a part of Pride Wrestling in the past. One of those is 'The Best In Th Galaxy' Nikki Storm. Well the Storm is returning to Bridgeton on Saturday night but she'll come face to face with an opponent who has run through the majority of the female division in Pride, Layla Rose. Rose says that Nikki Storm is just another Barbie to break. Storm is back to prove why she's not just the best in the galaxy but the saviour of the Pride Wrestling universe. 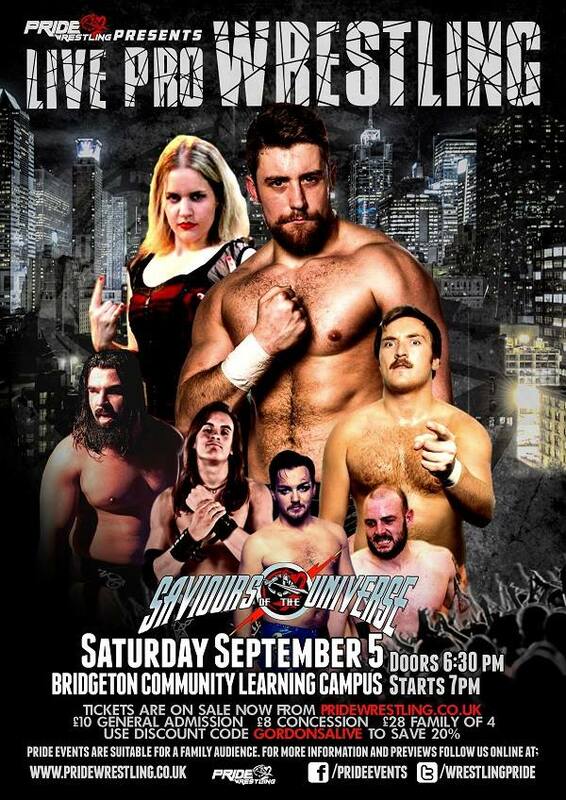 Originally a match between DCT and Chris Renfrew was scheduled for September 5th until an injury forced Renfrew to withdraw. However, the current N7 champion was given the chance by The Gaffer to choose a replacement for himself. And what a replacement he chose former champion, Joe Hendry. DCT has shown the heart and determination he has which has made him such a big figure in Pride. He'll need all of it when he not only faces the 'Global Hero' but a ringside surrounded by Chris Renfrew and The Gaffer's henchmen. 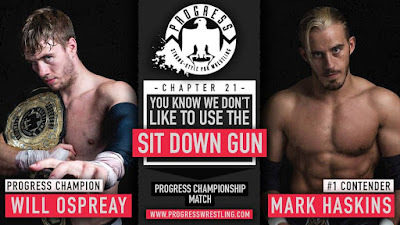 And finally on to Sunday and there was only really one show we could focus on and that was Progress Wrestling's Chapter 21: You Know We Don't Like To Use The Sit Down Gun. The main event shall see the first defence by Will Ospreay of the PROGRESS Championship. 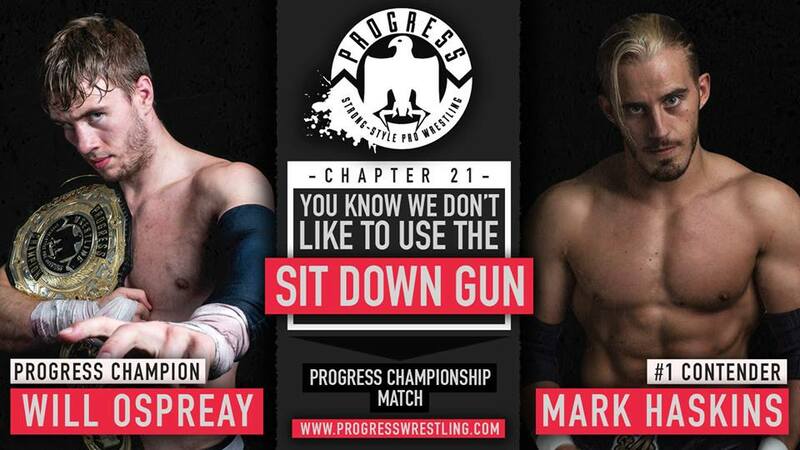 Ospreay gave everything to finally end the reign of Jimmy Havoc at Chapter 20 but now a new challenge presents itself in the shape of the 2015 Thunderbastard winner, 'The Star Attraction' Mark Haskins. Ospreay may have gotten out of the proverbial frying pan, he's now in the fire. This is a big test for ' The Aerial Assassin' against one of the best in Europe. Speaking of tests, Tommy End and Michael Dante have shown that they want to be tested as they've issued an open challenge to any team in the world to come and face them this Sunday at the Electric Ballroom. Who shall answer the challenge? We'll find out on Sunday! At Download Festival this year, El Ligero attacked James Davis in the aftermath of their match. Since then Davis has had no chance of retribution. Well that all changes this Sunday as El Ligero and his Origin team-mate, Nathan Cruz face The London Riots in a tag team match. Dealing out pain is always on The Riots minds. This time it has the added flavour of revenge with it. That wraps up this week's preview of the weekend's wrestling schedule. Of course, there are many more events taking place over the three days. To find out more about the shows we've highlighted here as well as all the others, check us out at www.wrestleropesuk.wordpress.com for the latest show and match announcements, British Wrestling event list and more.